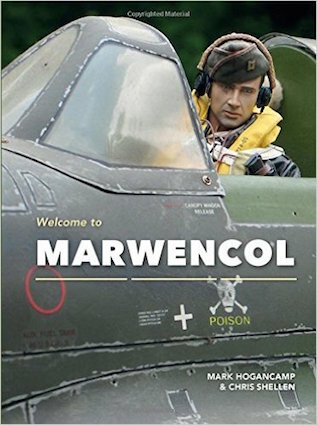 Have you been to Marwencol? Mark Hogancamp is a celebrity – and for good reason. Obscure people who suddenly become famous are often famous for doing something of no great value. They have 15 minutes of fame and that’s it. Mark Hogancamp is the exception. He was simply doing something to deal with his recovery after being beaten almost to death in 2000. He built a little village that he calls “Marwencol”, that he says is frozen in time in World War II Belgium. And he makes all the characters in the village out of commercially produced military figurines, Barbie dolls, and movie action figures, creating their looks, clothes, equipment, everything to the finest detail. 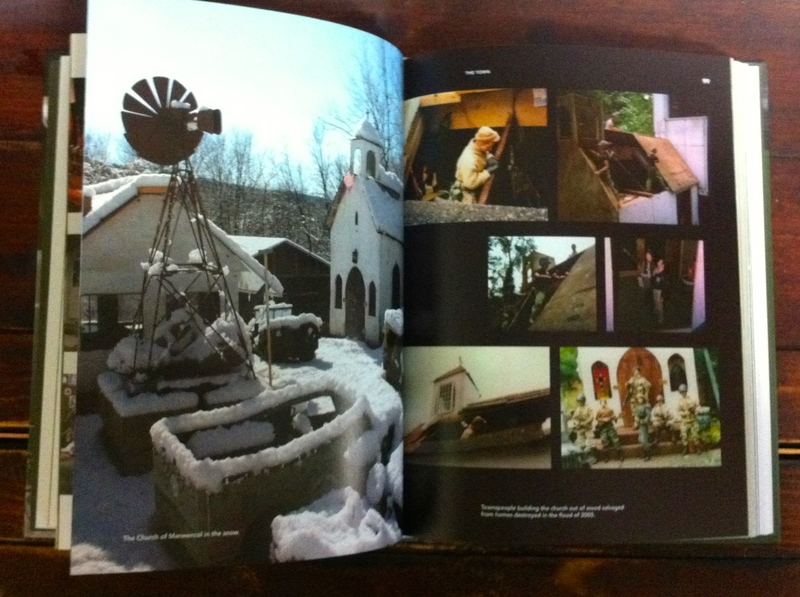 Then he photographs it all and tells stories about Marwencol, and the people living there. This little world he made outside his trailer, basically in the bare dirt, all painstakingly by hand. He is obviously a wonderful model maker, and a fine photographer. What you see and what you think it means, is what it is and what it means. Look at the definition of art: – Art may be characterized in terms of mimesis (its representation of reality), expression, communication of emotion, or other qualities. A work of art is a product of imaginative or technical skill stemming from human agency and creation. In which case, though Mark Hogancamp did not intend this, having made Marwencol as a “therapeutic outlet”, the world he has created is, indeed, art. The attention to detail, the mood he created, the way he sculpts the dolls into poses, the way he sets the scene, his own narrative and the story he has invented around it, all those combined makes for a unique – the word is not used lightly, there really is nothing else like it – creation. 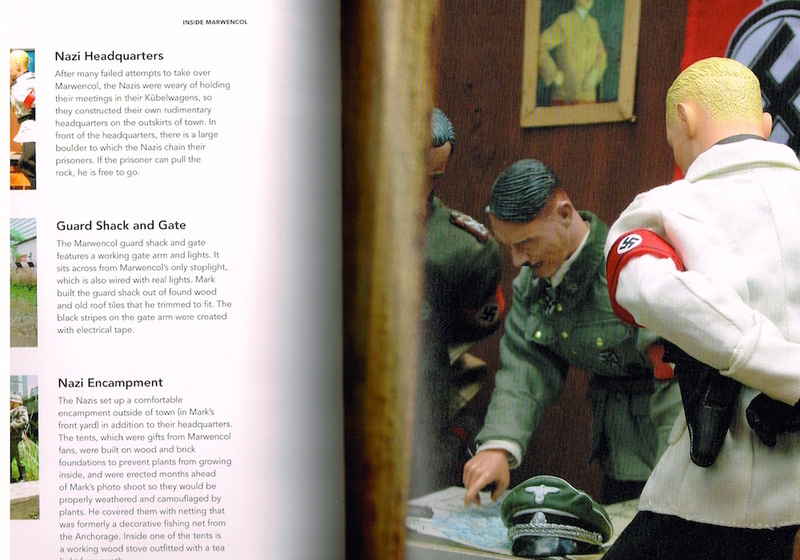 Mark has now moved on from the 12 inch, 1:6 scale figures, and their matching buildings and equipment, and he is working even smaller scale, with his “man-sized” (doll) figures photographed picking up and posing even smaller figures (p. 116). Mark worked on his own for many years until he was discovered in 2005. He may be an artist, but he remains, willingly, it seems, an “Outsider Artist” and now an increasingly famous one. As it’s explained in the book, he has been confronted by fans who found out where he lived and pitched up on his doorstep. Luckily those un-asked for close encounters have been mitigated by greater acceptance from the people in the town where he lives and works. The term “Outsider Art” was coined by art critic Roger Cardinal in 1972 as an English synonym for “Art Brut” (French for “raw art” or “rough art”), a label created by French artist Jean Dubuffet to describe art created outside the boundaries of official culture. The term is often applied to self-taught or naïve art makers who were never institutionalized but have had little or no contact with the mainstream art world or art institutions. In many cases, outsider art illustrates extreme mental states, unconventional ideas, or elaborate fantasy worlds. This is very like the case of Mark Hogancamp and his Marwencol creation – and is how I think of him. Of course, by giving him this label, he becomes less of an Outsider Artist and more of a mainstream, famous artist. Perhaps I should not label him and try to fit him into a category. 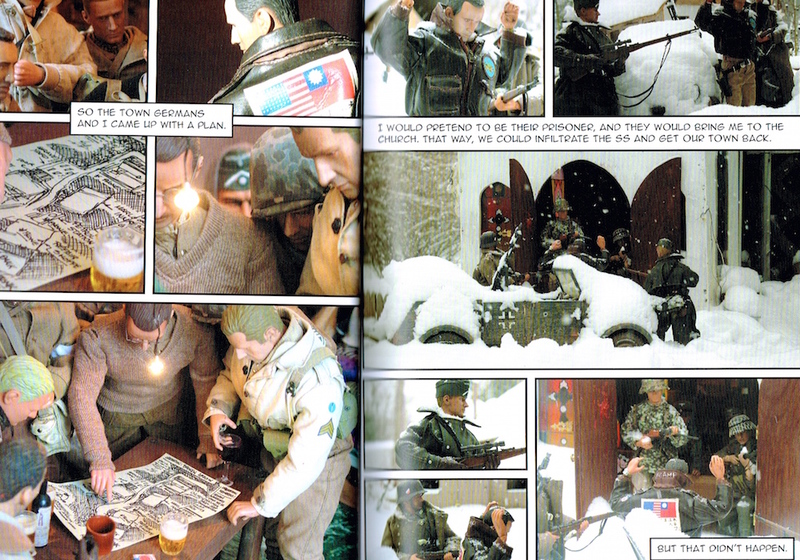 Marwencol is, after all, one of a kind. Mark created the five men who beat him up and left him for dead as five vicious SS soldiers who keep attacking Marwencol and fight with the hero, “Captain “Hogie” Hogancamp”, Mark’s alter-ego. Mark’s lawyer, who led the prosecution in the trial after the attacks, Emmanuel Nneji, then assistant district attorney for Ulster County, wrote years later, that Mark’s art touched him very significantly. And that’s what you notice if you look long and hard at the photos Mark created: – this is getting revenge if you have no chance to do so in real life. This is finding love, being a hero, defending your home, when in real life, you have no power or influence, and you’re all alone. The dolls’ little hands clutch each other. They put solicitous arms around each other. They stare into each others’ plastic eyes. They shoot or behead their enemies and hang them up by the ankles in the main street. Sometimes it gets creepy and sad and you realize this is not a fun project. It’s the outpouring of a soul. From having a type of puerile inquisitiveness about this man and his dolls, I went to having undoubted admiration for his skill and a fondness for the little world of Marwencol. It really is genius. I think Chris Shellen and the other writers like Tod Lippy handle their subject with respect, admiration and sympathy. It could not have been easy. 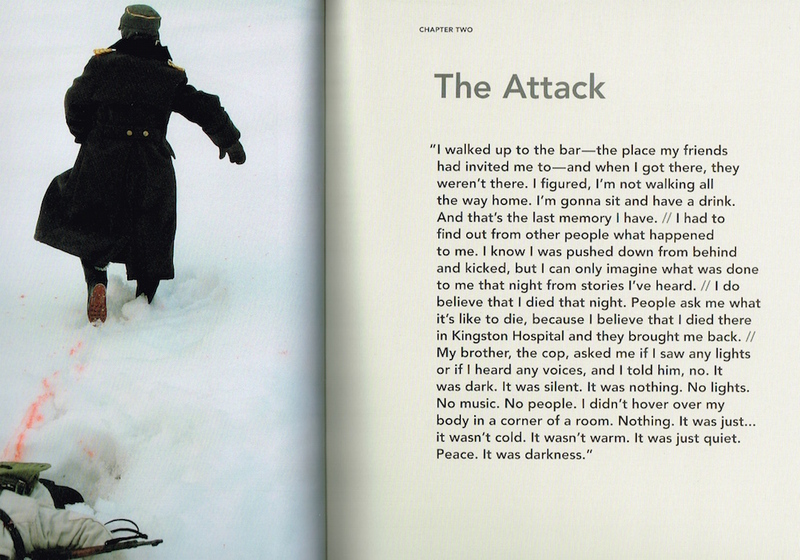 The man is real after all – he’s alive and living in Kingston, New York – and in Marwencol. He has had enough of a hard time already. There is a little scene (p.129) where one of the men dolls rescues a girl doll from a packing box. It looks so lifelike with the human-sized hand reaching in to give the man doll a knife to open up the box with and take the girl into his arms, like an unwrapped present. See? That’s what it does. Makes you talk about it as if it were real. The documentary film, Marwencol, reveals some but not all of Marwencol and its creator. It is an interesting introduction, but to get the detail, to get to the heart of it, read the book. You will be amazed. I cannot describe Mark Hogancamp any better than the writeup on his website, Marwencol.com. The pictures speak far louder than words ever could.